Captain Jack Sparrow has led a very colorful life pilfering and plundering his way through the high seas and seedy ports around the world. There was a time when the world wanted to know what this practically peculiar privateer would do next after a grand adventure but now, it is evident that that time has washed away with the tides. In the fifth installment of the Pirates of the Caribbean saga, titled Dead Men Tell No Tales, Captain Jack has run afoul of some very harsh misfortune. Meaning, he’s broke, he hardly has a crew anymore and he still hasn’t managed to get his beloved Black Pearl out of that bottle from the last movie. To make matters worse, Jack’s reckless actions have awakened an army of ghosts, led by a Spanish pirate-hunter named Salazar, hell-bent on casting every buccaneer, marauder and freebooter to Davy Jones’ locker-or is it Will Turner’s locker since Davy Jones is dead and Will has replaced him? Who knows! Anyway, Captain Jack’s only hope to save himself? He must ally with Henry Turner, the adult son of Will and Elizabeth, and the beautiful and headstrong woman of science Carina Smith to find the Trident of Poseidon, a powerful artifact that will endow upon its holder total command of the seas. When the end credits started rolling on Pirates of the Caribbean: Dead Men Tell No Tales, someone tried to gauge my thoughts on the film and all I could tell them was: “Listen, I’m just thankful it’s over!” I want to let you know that this is not my official reflection of the film, but the franchise in general since this is supposed to be the final adventure of the series. Officially, I found this movie drudgingly unnecessary and mildly mediocre. I will admit that it was nice seeing Captain Jack, Gibbs and Barbossa again and I was willing for this franchise to shanghai me aboard for one last adventure on the high seas but while I was watching this, it dawned on me that I just outgrew this franchise; the magic and the appeal had waned; also I found it convenient that this movie had ghost sharks because with this movie this franchise definitely jumped over them! I thought this movie had continuity errors, had a lack of balance in the subplots between the characters, had twists that strained credulity and what’s more it had me asking why didn’t anyone come up with this “Trident” concept two movies ago? Why couldn’t they just leave the franchise with the ending from the third movie where everything was just full circle and tied everything together nicely rather than force this happy ending from this installment upon audiences? I just couldn’t comprehend why the producers of this movie couldn’t leave well enough alone?! Johnny Depp is business as usual as Captain Jack Sparrow, Geoffrey Rush as a well-to-do Barbossa was okay, Kevin McNally, Martin Klebba, Stephen Graham were faces I didn’t mind seeing again and it was cool that they brought Orlando Bloom and Keira Knightley back. As for the newcomers to the story Javier Bardem steps into the CGI-aided role of Salazar and even though he has a reputation of playing a damn good villain, I feel as though he phones it in due to poor writing courtesy of Jeff Nathanson. Brenton Thwaites, Kaya Scodelario and Golshifteh Farahani did alright as well. Even Sir Paul McCartney snuck aboard! That was a hoot for a minute. Directors Joachim Rønning and Espen Sandberg’s efforts to try and put wind back into the sails of this franchise were wasted. Paul Cameron’s cinematography, Roger Barton and Leigh Folsom Boyd’s editing, Geoff Zanelli’s score, Nigel Phelps’ production design, Penny Rose’s costumes, the art direction, the visual effects; everything technical is just more of what you’ve seen before. I for one hope that Dead Men Tell No Tales is the farewell voyage of the Pirates of the Caribbean saga even though it had some post-credits scene I didn’t bother to stick around to see! The era of Captain Jack has come and gone; he has the Pearl back and I pray that Disney will leave him be from this day forward! The swashbuckling Disney franchise that set sail on the high seas 14 years ago will come to a close (finally)! Captain Jack Sparrow has lived an “exhilarating” life to say the least. One could call it a true Pirates Life but his greatest adventure before him draws back to the past when Captain Salazar leads an army of the dead across the seven seas on the hellbent mission to exterminate every able bodied man or woman who sails under pirate colors. Salazar, like many, bears a grudge against Captain Jack and our heroic and plucky pirate hero’s only salvation is a mythic artifact that could turn the tides of the ocean forever. Sailing into theaters this weekend is Pirates of the Caribbean: Dead Men Tell No Tales. What am I expecting to see? : I honestly love the Pirates of the Caribbean franchise and the kooky lead character of Captain Sparrow but this franchise needs to end in the worst way and I thank heavens that Dead Men Tell No Tales will end it! I hope this is entertaining, it brings the right amount of closure to this series and it ends on a high note. This is a great cast of actors and I don’t want to see any of their talents go to waste. I’ve been looking forward to Pirates of the Caribbean: Dead Men Tell No Tales for a while now and I hope it is everything that I ask for. The Pirates of the Caribbean franchise will always hold a very dear place in my heart. Probably because Captain Jack Sparrow is one of the most peculiar characters I have ever seen on the big screen and his antic and exploits on the high seas are nothing short of swashbuckling fun. Big fan of the first three pictures, and I actually enjoyed On Stranger Tides, so in a way I’m looking forward to the next installment, Pirates of the Caribbean: Dead Men Tell No Tales, but truthfully I hope this is the final Pirates of the Caribbean movie; it’s getting old and played out already. Johnny Depp, Geoffrey Rush, Kevin R. McNally and Stephen Graham will ship out once again, and joining them will be a very familiar face: Orlando Bloom will reprise his role as Captain Will Turner. You may recall that when we last left Will, he had basically signed away his life to be the captain of the Flying Dutchman, and can only visit his beloved Elizabeth once every ten years. He’s got an interesting character arc, and while he’s not as colorful as Jack Sparrow, he helps ground the films with real stakes. Rounding out the cast is Kaya Scodelario, Brenton Thwaits, Golshifteh Farahani and Academy Award winner Javier Bardem. Jeff Nathanson’s name is on the screenplay and Espen Sandberg and Joachim Rønning are directing the fifth installment of the franchise. Pirates of the Caribbean: Dead Men Tell No Tales sets sail on July 7, 2017. Today, production officially began on Pirates of the Caribbean: Dead Men Tell No Tales. Academy Award nominee Johnny Depp will once again, reprise his signature role of the peculiar pirate Captain Jack Sparrow in the new adventure written by Jeff Nathanson and directed by Espen Sandberg and Joachim Rønning. Aside from Depp, Academy Award nominee Geoffrey Rush will return as Sparrow’s swashbuckling rival Barbossa, Kevin R. McNally as Captain Jack’s trusty sidekick Joshamee Gibbs and Stephen Graham as Scrum, from the previous Pirates installment. Joining the film is Academy Award winner Javier Baviem, Kaya Scodelario, Brenton Thwaites and Golshifteh Farahani. The official synopsis of the fifth installment of the high seas franchise has been released. In the new adventure, a down-on-his-luck Captain Jack Sparrow (Depp) finds the winds of ill-fortune blowing even more strongly when deadly ghost pirates led by his old nemesis, the terrifying Captain Salazar (Bardem), escape from the Devil’s Triangle, determined to kill every pirate at sea…including him. Captain Jack’s only hope of survival lies in seeking out the legendary Trident of Poseidon, a powerful artifact that bestows upon its possessor total control over the seas. My reaction: ugh! This franchise is a particular favorite of mine and I enjoy Johnny Depp portray Captain Jack on screen, but for the love of all that is pure I want this to be the FINAL Pirates of the Caribbean movie! I’ll get out of bed to see this movie, it looks and sounds like fun, but these adventures on the high seas are starting to become shallow. Pirates of the Caribbean: Dead Men Tell No Tales sails into theaters on July 7, 2017. The screenplay is penned by Jeff Nathanson, who wrote the screenplay for “Tower Heist” and the screen story for “Indiana Jones and the Kingdom of the Crystal Skull,” and the directing duties fall to the directors of “Kon-Tiki,” Espen Sandberg and Joachim Rønning. 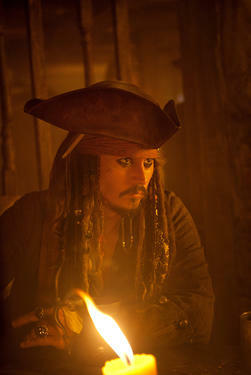 “Pirates of the Caribbean: Dead Men Tell No Tales,” is set for production in 2014 and is scheduled for release in, you guessed it, 2015. Meaning this latest installment to this swashbuckling franchise will be released around the same time as “The Superman-Batman Project” and “The Avengers: Age of Ultron.” Is Captain Sparrow ready to contend with superheroes? Let’s find out. Update: According to reports, “Pirates of the Caribbean: Dead Men Tell No Tales,” has been pushed back to summer 2016. From what the reports indicate, the studio is giving the new screenwriter Jeff Nathanson and new directors Espen Sandberg and Joachim Rønning more time to adapt to the scale of the project rather than rush them into the spotlight with one of Disney’s profitable franchises. Such a shame. I was looking forward to see Captain Jack Sparrow duke it out at the box office with “The Avengers” as well as Batman and Superman. Still, I’m looking forward to the new swashbuckling installment all the same.